Cooking pastes are traditionally made by blending fresh herbs and dried spices, often with the addition of oil. They are widely used as the basis of a dish, containing the full medley of flavours required in recipes such as curries. However, the dried spice blends that we create at Seasoned Pioneers are the alternative option to a cooking paste, offering a much longer shelf life and equally intensive flavours. As purveyors of specialist ingredients, we include within our range two essential pastes used in Southeast Asian cuisine, Thai Kapee Shrimp paste and Tamarind paste. Cooking pastes abound in countries such as Thailand, where they are handmade and presented in colourful mounds on the market stalls. Fresh herbs and spices such as Lemongrass, Galangal, Chillies, Garlic, Coriander and Kaffir lime leaves are pounded together with spices using a mortar and pestle. The ingredients of each cooking paste are tailored to particular dishes such as Red curry, Massaman curry, Yellow curry, Penang curry and Green curry. The varied ingredients used are apparent in the kaleidoscopic colours of the different cooking pastes. Western supermarkets offer a wide range of cooking pastes for many types of cuisine. They are mostly sold in jars and whilst they can offer satisfactory results, they do not have the intensity of flavour that you will find in a handmade cooking paste. This is where spice blends come into their own as they can be sautéed with produce such as fresh onions, garlic and ginger before the addition of the main ingredients of a recipe. This results in robust flavours that infuse the entire dish and should you require even greater convenience, we suggest using our ready crushed ingredients of Garlic, Ginger and Red Chillies. 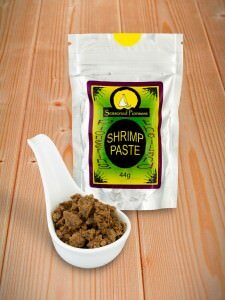 Although not strictly a cooking paste, rather an ingredient that is produced as a paste, Shrimp paste is integral to the cooking of many regions including Southeast Asia, Southern China and Bangladesh. It is used extensively in these cuisines as it imparts a rich and robust savoury flavour to food and replaces the need for salt. The fruits of the Tamarind tree are long pods containing a brown fleshy pulp with an intensely tart flavour. Widely used in South Asia, Africa, the Middle East and Mexico, the pulp is added to dishes to achieve a sweet-sour taste. The Tamarind pods contain fruit, seeds and fibrous material. 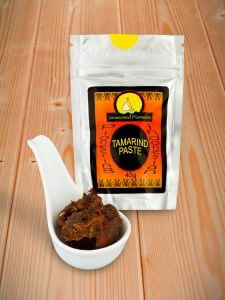 Seasoned Pioneers Tamarind paste is the pure fruit with the seeds and fibres removed. However, we do advise a little caution as occasionally some seeds may be present. Other tamarind pastes on the market may have been adulterated with water and sugar, but you will find that using the pure fruit pulp will give the best results to your cooking. The simplest way to use the thick sticky paste is to first cover it with hot water as it will soften and can then be easily be added to your dish. Doing this also allows for any seeds to be removed from the paste. Further information about this delicious and essential ingredient can be found in ‘The Knowledge – Tamarind unveiled’.